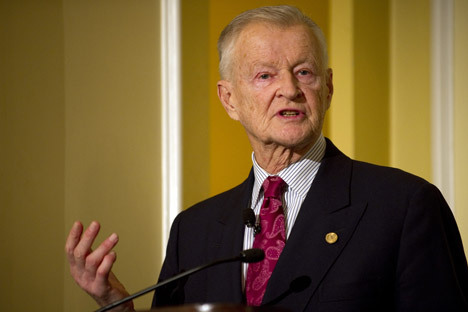 Zbigniew Brzezinski spoke to RBTH on his strategic vision of Western-Russia relations and international affairs. One of the best known foreign policy experts of our time, Zbigniew Brzezinski spoke to RBTH after the release of his 2012 book, “Strategic Vision: America and the Crisis of Global Power.” The work examines the shift of global power from West to East and possible scenarios if the United States fails to maintain its stabilizing influence in the world. Brzezinski is an adviser and board member of the Center for Strategic and International Studies focusing on current and upcoming trends in Russia-Western relations. A former national security adviser to President Jimmy Carter, Brzezinski remains a significant voice on international affairs. RBTH: In your recent book “Strategic Vision: America and the Crisis of Global Power” you argue that the West should embrace Russia. Do you believe that some sort of genuine strategic Western-Russia partnership could still be achieved even if not in the short-run, but perhaps in more distant future? Dr. Zbigniew Brzezinski: I think that Russia should be a member of Euro-Atlantic community. Russia is a European country and should be part of it. But, of course, that community means partnership among democratic partners. I’m very explicit in my book and I happen to believe that in fact civil society motivated by democratic principles and democratic convictions is emerging in Russia. Whether it will become the dominant political reality is still an open question. RBTH: As you may know many Russians feel that at least culturally, Russia is in fact a part of the West. One could argue that there is no need to move toward the West because we are part of it. Dr. Zbigniew Brzezinski: I think there is confusion regarding what we are talking about. Germany has also always been a part of the West, but Germany during some years in the 20th century deviated very far away from democratic principles and wasn’t part of the West at that time. I argue in my book that Russia culturally and historically is in fact a Western society. But that does not automatically mean that it is a democratic society. The Euro-Atlantic community has to be democratic and I have high degree of confidence that in fact the younger Russian generation and especially the younger member of new middle class are genuinely democratic. The critical question is: are Russia’s political institutions, political processes and political traditions democratic? RBTH: Former State Secretary Henry Kissinger recently has publicly suggested that incoming Russian President Vladimir Putin in not anti-Western and he can turn out to be a constructive partner on specific issues. Do you believe Putin can drive Russia closer to the West? Dr. Zbigniew Brzezinski: I’m not going to make predictions about Mr. Putin. I think when he becomes President, once he considers seriously the geopolitical dilemmas that face Russia, not to mention some social problems like demographic difficulties, he might very well come to a conclusion that will surprise us all. However, I’m not prepared to issue good democratic conduct certificates until actions speak louder than words. RBTH: China will be a bigger factor in Russian foreign policy, according to experts, especially if relations with the West deteriorate. Do you believe that it is going to be a temporary or tactical Russia-China convergence on foreign policy matters or is it more a sort of strategic approach? Dr. Zbigniew Brzezinski: I think first of all that it is not necessarily the case that Russia’s relations with the West will deteriorate. I’m not prepared to flatly predict that this would be so. Although some of Mr. Putin’s actions and words seem to possibly indicate that. However if Russia decides to focus on its relationship with China as the primary source of its global importance, namely through some sort of special relationship with Beijing, then most Russians, I think, are aware of the fact that in such relationship Russia would be the junior partner of a much more dynamic and much more rapidly growing, much more socially effective, modernizing China. If Russia-China relations are to become strategic the consequences have to be understood in advance. And I’m not sure that those Russians who see themselves as naturally part of the West, as you rightly mentioned, are going to be satisfied with this. RBTH: Some Republican presidential candidates have expressed strong anti-Russian sentiment, especially during debates and have called for an end to the reset policy. If a Republican candidate prevails in the upcoming Presidential elections, is it safe to say that U.S.-Russia relations will suffer accordingly? Dr. Zbigniew Brzezinski: I think it is safe to say that Republican presidential debates are not serious and they shouldn’t be taken seriously. They are to some extent an intellectual embarrassment. Because they are shallow, ignorant and totally detached from any serious policy choices even if one of Republican candidates was to win the presidential election. But the fact that so many of their statements on foreign affairs are literally ludicrous, I think, is also an indication that it is not very likely that one of them will win the election. RBTH: When you were national security advisor to President Jimmy Carter, you did your utmost to drive the Soviet Union out of Afghanistan. But more than 30 years later Russia is fully supportive of the U.S. and NATO mission in this country and contributes to the extent possible to its success. Do you think the Russia-U.S. partnership is sincere and if yes, why? Dr. Zbigniew Brzezinski: I think it is sincere because it is derived from rational and intelligent self-interest. I think that non-communist Russia realizes that if the forces of fundamentalism and extremism were to prevail in Afghanistan the results would spread to Central Asia and probably also to the 30 million Muslims within Russia. Also I think Russians realize that American objectives in Afghanistan have been scaled down from President Bush’s exuberant predictions that Afghanistan would become a moderate democratic state. Now the expectations are that when America leaves some sort of a more traditional arrangement in Afghanistan perhaps reinforced by regional guaranties will provide stability and recovery, especially if the outside world and particularly America remain committed to the provision of economic assistance to post-conflict Afghanistan. RBTH: Moscow and Washington have disagreements over the role of the United Nations in international affairs and the case of Syria speaks for itself. What role should international institutions and first and foremost the United Nations play in your strategic vision of the future world order? Dr. Zbigniew Brzezinski: That depends very much on whether what I advocate in my book “Strategic Vision” will come to pass. I think that international cooperation is more likely if we have more stability among the great and most important regions of the world in which there is more wealth and more development present. If the Euro-Atlantic community manages to strike a reasonable balance in our relations with China, but also with Japan and India and if Russia is active in that context as an increasingly influential voice in the West, I think we will have a better chance of reaching consensus. Not only regarding specific problems that confront us today such as Syria, but even more basic ones regarding problems that will probably confront all of humanity during the rest of the century. In my judgment this is not going to be a century in which there is the hegemony of a single power. The choice for the 21st century is not hegemony or peace, but it’s a choice between chaos and cooperation. Alexander Gasyuk is the Washington, D.C. correspondent for Rossiyskaya Gazeta.